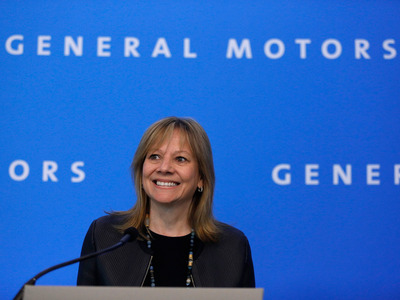 Bill Pugliano / StringerGM CEO Mary Barra. GM is joining the growing chorus of employers looking for ways to shake up the US healthcare system and lower the cost of their employees’ healthcare. In 2019, the company will offer its salaried employees in Southeast Michigan a plan that works directly with Henry Ford Health System. Through that plan, the employees and their families can go to the health system for everything from primary-care visits to hospitalizations and emergency-room care. General Motors has a plan to keep a lid on rising healthcare costs. In 2019, the company will offer its salaried employees in Southeast Michigan a plan that works directly with Henry Ford Health System, covering about 24,000 employees and their families. Typically, insurance companies are in the middle to handle the logistics of getting a patients’ claim from one place to another, which means you might not realise your employer’s footing the entire bill on the other end. But that’s not the case in the GM-Henry Ford Health System deal. Instead of using a health insurer, GM negotiated the terms of its plan with the hospital system directly, an agreement dubbed a “direct-to-employer” contract. Blue Cross Blue Shield of Michigan, the insurance company covering some GM employees, will still be involved to process claims and some customer service inquiries. But instead of setting up a plan that provides a fee for every service like an MRI or annual check-up, GM could set up contracts that reward the health system based on how healthy it keeps GM’s employees. During open enrollment this upcoming fall, the salaried GM employees in southeast Michigan will have the option to pick the Henry Ford Health System plan, in addition to two other plans. For those who opt into that plan, they will save about $US300 to $US900 a year compared to the other two plans and will be in the custom Henry Ford network, although the deductible and other aspects of the plan remain the same. GM picked Henry Ford to be the first provider as part of the “ConnectedCare” plan after more than a year of vetting different health systems. Savageau said she’s hoping about 20% of the 24,000 employees who are eligible will sign on. Employers are trying a number of different ways to cut down on their healthcare spending. The city of Rockford, Illinois, sued a drugmaker after realising it was spending almost $US500,000 on one drug. Others have formed coalitions to take on high prices using collective-bargaining power. Others have set up similar plans to GM directly with hospitals to cover certain surgical procedures or other benefits to their employers. In January, JPMorgan, Amazon and Berkshire Hathaway announced their plans to form a new independent venture aimed at lowering healthcare costs for their employees. The trio in June tapped surgeon and professor Dr. Atul Gawande to be the CEO of the new venture, which will be based in Boston.